There is nothing like a bit of culture or entertainment after a meal. Satisfy your appetite for food first, then feed your mind with a good film or play. 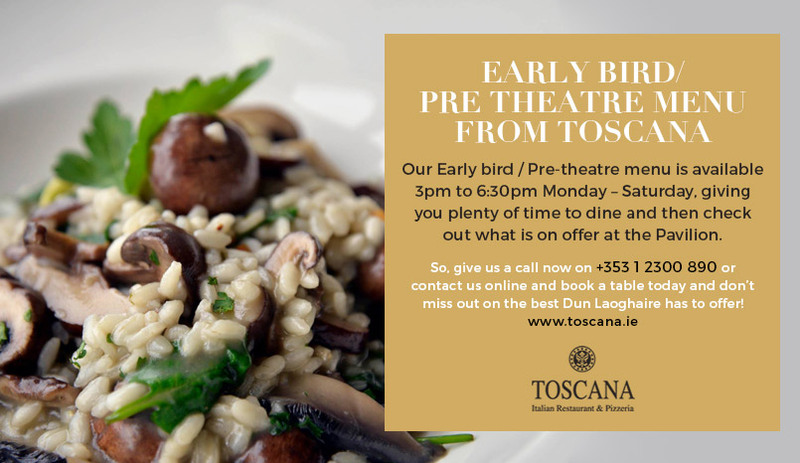 Our Early Bird / Pre-theatre menu is designed to fill you up so you can go to the theatre without worrying about getting hungry and having to get up and go for a snack during the interval. Enjoy the show in comfort and relaxation with a sated appetite. The Pavilion Theatre is a cultural hive of activity and entertainment which was established in 2000. The Pavilion shows films and plays as well as playing host to music and dance companies from all around the globe. With a diverse programme of events, it entertains audiences from all over Ireland and the world. Our food, together with the culture and entertainment on offer at the Pavilion, constitute a great night out, whether you are a couple, a family or a gang of friends or culture vultures. Delight your taste buds then stimulate your mind: it’s the best Dun Laoghaire has to offer if you are looking for a pleasurable day or night out. 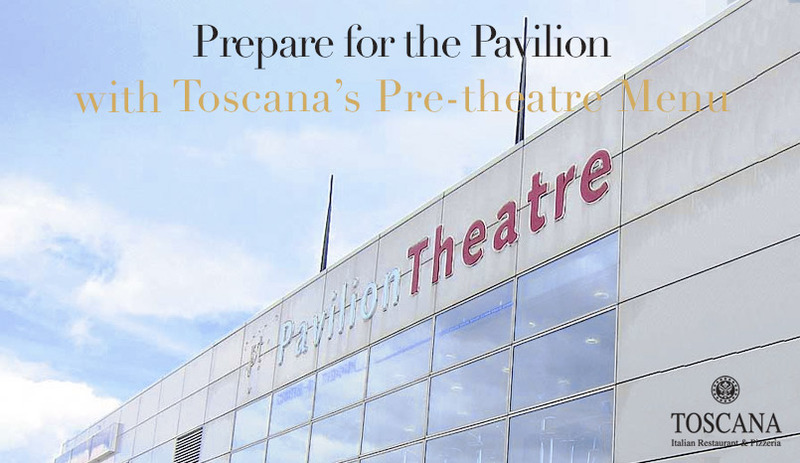 Get real satisfaction out of your visit to Dun Laoghaire by dining at Toscana’s before checking out what’s on offer at the Pav. Our Pre-theatre menu is diverse: as diverse as the programme of entertainment offered by the theatre itself. For starters we offer Suppli, golden croquettes of mozzarella cheese and rice served with our garlic dip. 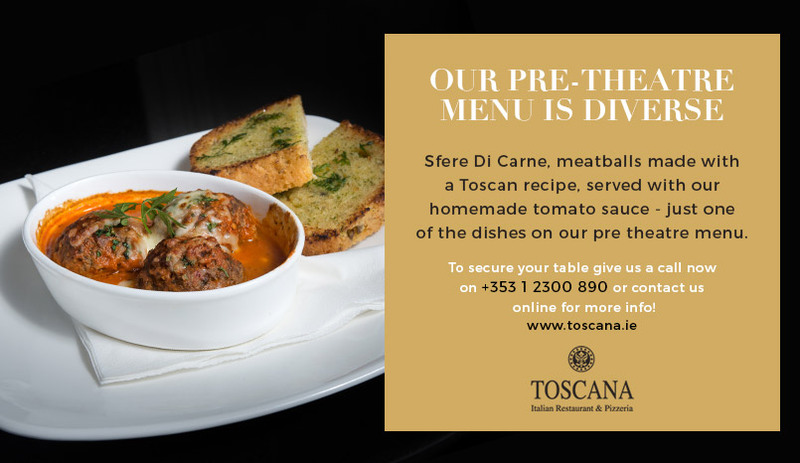 Or how about our Sfere Di Carne, meatballs made with a Toscan recipe, served with our homemade tomato sauce? We also offer chicken wings and minestrone soup amongst other delectables. For mains, we offer Tagliatelle alla Toscana, a pasta perfectly tossed with chicken fillet and flavoured herbed cream sauce. For vegetarians we have the Risotto Vegetariana, a traditional risotto with seasonable vegetables and gorgonzola cheese. Our Bistecca Di ManzoPenne is an Irish charcoal grilled sirloin steak served with peppercorn sauce or garlic butter. If these don’t get your mouth watering, there are plenty of other dishes on offer (as well as some vegan friendly Italian options). For dessert, our Tiramisu is a traditional Italian recipe homemade with biscuit, coffee, amaretto and brandy. Or maybe try our Gelato all Meringue, a meringue with homemade vanilla ice-cream topped with butter scotch sauce and almonds. Our Early bird / Pre-theatre menu is available 3pm to 6:30pm Monday – Saturday, giving you plenty of time to dine and then check out what is on offer at the Pavilion. So, give us a call now on +353 1 2300 890 or contact us online and book a table today and don’t miss out on the best Dun Laoghaire has to offer!